by Chris Woodford. Last updated: October 7, 2018. What makes night-time cities fizz and crackle with life? Brightly colored neon lamps play a huge part. If you've ever seen the lights dancing in Tokyo, New York City, or London, you'll know exactly what I mean. Whole streets seem to leap alive the minute the neon switches on. Strictly speaking, lamps filled with neon gas can make only red light and you need other gases to make other colors. In fact, by mixing different gases, it's possible to make over 150 different colors of "neon" light—and paint the night sky with almost any color you like! Let's take a closer look at how these things work. 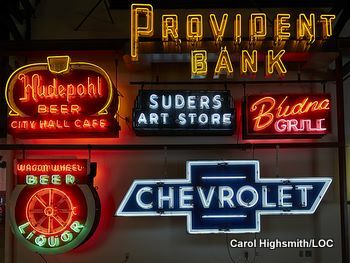 Photo: A display of vintage neon signs at the American Sign Museum in Cincinnati, Ohio. Photo by Carol Highsmith courtesy of US Library of Congress. If you've read our article on light, you'll know that atoms produce light when they absorb energy and become "excited". In their excited state, they're also unstable—so they rapidly give out the energy they absorbed to get themselves back to normal again. They do this by giving out tiny packets of light energy called photons. 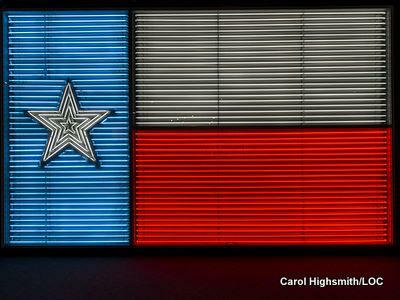 Photo: A neon sign version of the Texas "Lone Star" flag at the Institute of Texan Cultures, University of Texas. Look at the closeup photo on the right and you'll see that each "stripe" in the flag is made from a separate glass tube, a bit like the fluorescent strip lights you might have in your kitchen or classroom. The "stars" contain single tubes that have been heated, bent round into angles while hot, then allowed to cool again. You can make all kinds of letters, characters, and other shapes by bending tubes in this way. Photo by Carol Highsmith courtesy of US Library of Congress. There are electrical terminals at either end of a neon tube. At one end, there's a negative terminal ("-ve", shown blue); at the other end there's a positive terminal ("+ve", shown green). 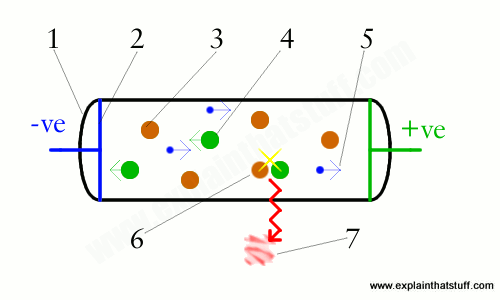 When the tube is switched off, it contains ordinary atoms of neon gas (brown circles). Rig the terminals up to a high-voltage power supply (about 15,000 volts—because you need a lot of "electrical force" to make things happen) and switch on, and you'll literally start pulling the neon atoms apart. Some of the atoms will lose electrons to become positively charged ions (big green dots). Being positively charged, these neon ions will tend to move toward the negative electrical terminal. The electrons the neon atoms lose (small blue dots) are negatively charged, so they hurtle the opposite way toward the positive terminal at the other end of the tube. In all this rushing about, atoms, ions, and electrons are constantly colliding with one another. Those collisions generate a sudden smash of energy that excites the atoms and ions and makes them give off photons of red light. So many collisions happen with such rapidity that you get a constant buzzing of red light from the tube. You also get quite a lot of energy given off as heat. If you've ever stood near a neon light, you'll know they can get very hot. That's because the atoms are giving off quite a bit of invisible infrared radiation (in other words, heat) as well as visible radiation (better known as red light). Why is neon light red? Photo: When electrons in neon atoms return from their "excited" state to their "ground" (unexcited) state, they give out packets of energy called quanta that our eyes see as red light. 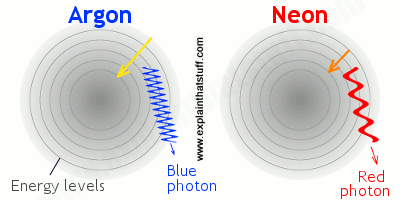 In argon atoms, the quanta are bigger and our eyes see them as higher-frequency blue light. The energy levels inside atoms are a bit like rungs on a ladder or steps on a staircase. Electrons can only be on the rungs or steps, not on the gaps in between. That means atoms can absorb or release energy only in fixed-sized packets (called quanta, which is the plural of quantum) and atoms of different chemical elements will give out quanta that are bigger or smaller, depending on their precise inner structure. Atoms that give out bigger quanta of energy make higher-frequency (bluer) light than atoms that give out smaller quanta. In neon, the quanta of energy that are given out correspond exactly with light that we see as red. Other noble gases make light of different colors. Argon, for example, makes blue light—so when you see "neon" lamps shining blue, you're actually looking at tubes filled with argon, not neon. There are two ways to make other colors. You can put more than one gas in the same "neon" tube. To make green tubes, you need neon and argon together. For purple, you'd use argon and xenon. You can also change the color that a tube makes by painting its walls with phosphors of different colors. So you can use a blue phosphor painted on a red neon tube to make pink light, or a green phosphor with red neon to make orange light. You'll sometimes see neon signs referred to as an example of cold-cathode lighting. That doesn't make sense unless you understand that various other electrical devices use a hot cathode. But what is a cathode anyway...? In a lamp with two electrical terms, the positive terminal is called the anode (the green terminal in the artwork up above) and the negative one is called the cathode (the blue terminal on the left). In a hot-cathode device, the cathode has to be heated with a filament (a small heating element) so electrons "boil off" its surface—and then do something useful. Hot cathodes were used in vacuum tubes, which were used as computer switches before transistors were invented. They're also used in cathode-ray tubes, such as the ones that make the picture in an old-fashioned TV (one of those really old ones that sticks out at the back) and the graph-traces on oscilloscopes. The light you see on this kind of TV screen comes from energy released when the cathode is heated up so it gives off electrons. The electrons (which were historically known as "cathode rays") make your TV picture when they fly down the tube and smash into the phosphor-coated screen at the front. In a neon lamp, light is made by exciting gas atoms in the space between two electrodes and there's no need for a hot cathode. But just because the cathode isn't heated, it doesn't follow that a neon lamp is cold; indeed, you'll find neon lamps surprisingly hot if you stand anywhere near them! 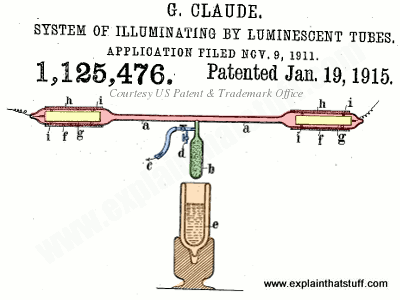 Artwork: From US Patent 1,125,476: System of illuminating by luminescent tubes by Georges Claude. Jan 19, 1915, courtesy of US Patent and Trademark Office. French chemical engineer Georges Claude (1870–1960) invented the neon lamp, filing his original French patent on March 7, 1910. The same year, he made his first, spectacular public demonstration of neon lighting at the Paris Motor Show, using two gigantic 12m (39ft) lamps. By 1913, neon lighting was being used in French advertising signs, though it didn't find its way to the United States until the 1920s. Here's a fascinating illustration from Claude's US patent, filed in 1915. You can see the main neon tube at the top (which I've colored red), with its two electrodes (yellow) at either end. Claude had discovered that impurities in neon gas could seriously affect how well his lamps worked, so the bits of apparatus in the middle were designed to purify the neon before the tube was electrically lit, then removed. The blue line is a link to a vacuum pump; the green flask contains wood or charcoal to absorb impurities; and the larger orange vessel underneath contains liquid air. Together, these things carried out what Claude described as "an exceedingly efficacious purification process on the spot in order to obtain a high degree of purity of the neon." Vintage Signs of America by Debra Jane Seltzer. Amberley Publishing, 2017. 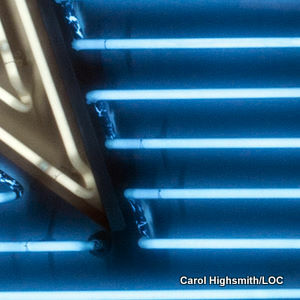 Flickering Light: A History of Neon by Christopher Ribbat. Reaktion Books, 2011. A fascinating cultural history of neon lamps—and how they changed the shape of modern cities. Vintage Neon by Len Davidson. Schiffer, 1999. A photographic history of classic neon signs with more than 350 pictures. Neon Techniques and Handling: Handbook of Neon Sign and Cold-Cathode Lighting by Wayne Strattman. ST Publications, 1997. Light: Scientific Pathways by Chris Woodford. Rosen, 2013/Blackbirch, 2004. This is one of my books, charting the history of optics and efforts to understand the science of light. Ages 9–12. Light by David Burnie. DK Books, 1998. One of the dependable DK Eyewitness books, this covers the science and technology with quite an emphasis on history. Also 9–12. Don't worry about the publication date: basic science doesn't date that much, and the book is still available. Neon by Edward Willett. Rosen, 2007. A short (48-page) guide to neon as a chemical element, setting it in the wider context of the periodic table. Again, best for 9–12. Hong Kong's Storied Neon Signs Get a Nostalgic Review by Chen May Yee. The New York Times, June 17, 2014. Neon signs played an important role in the cultural evolution of Hong Kong, according to a new exhibition. Old Signs of the Times by Alice Rawsthorn. The New York Times, May 6, 2012. How neon sites help to tell the story of a city. NASA Launchpad: Neon Lights - Spectroscopy in Action: A simple introduction to neon lights and how the principle of different gases making different colors can be used in astronomical research. The Making of Neon signs: An introduction to the people who craft neon signs, from Hong Kong's museum for visual culture. Neon signs: A video slideshow of neon signs in Las Vegas and around. Museum of Neon Art: MONA, in Glendale, California, concentrates exclusively on neon signs. The Neon Museum: This museum connects the history of neon signs to the history of Las Vegas. Also check out their Instagram. The Neon Muzeum: A Polish neon museum, also with an Instagram. American Sign Museum: Based in Cincinatti, Ohio and devoted to all kinds of signs, not just neon.